More than 60 jobs have been safeguarded on Teesside following the acquisition of Redcar-based industrial services company CIS Northern. The deal was spearheaded by current regional director Mike Lee, who partnered with WSG UK and colleague Mike Winchester after seeking the help of accountancy firm, Anderson Barrowcliff. Following the instability suffered as a result of the closure of SSI in Redcar, Lee was determined to secure the company’s future, so approached Anderson Barrowcliff to help facilitate a deal that would support his vision of building a full service business for the region’s oil and gas, utilities, power, steel and manufacturing sectors. Operating as a larger unit using the skill set and industry knowledge from the WSG group, the newly-formed team is looking forward to the challenge of growing the business and bringing investment growth into Teesside’s business economy. “The great thing is we can now create an internal learning environment, with the team able to learn new skills and services from their colleagues,” said Winchester, who recently joined WSG UK as director following the acquisition. “Using a ‘mature apprenticeship’ style of training, as well as accredited courses, we’re hoping to strengthen and progress the team in even more technical services over the years. The company which will ultimately be re-branded as WSG Industrial Services, says it has an aggressive plan to increase turnover from the current group combined £17m to £25m in just three years and is now able to complete a full life-cycle of an overhaul, thanks to the multi-disciplinary skills on offer by the total workforce. 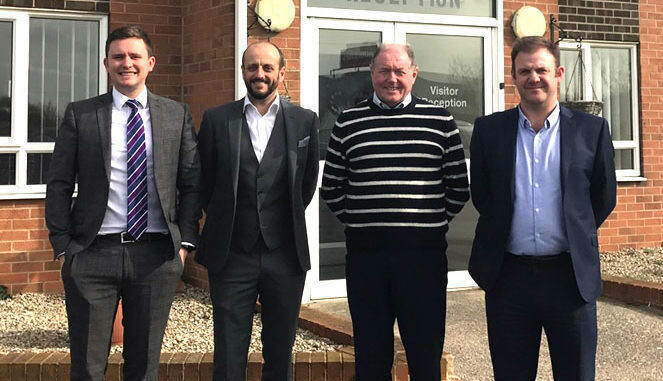 • Pictured above: Anderson Barrowcliff partner James Dale, WSG UK director Mike Winchester, CIS Northern regional director Mike Lee and WSG UK joint integrity business manager Gareth Todd.